The RVNA Spring Breakfast logo. Cramer & Anderson is once again a Silver Sponsor of the annual RVNA (Ridgefield Visiting Nurse Association) spring breakfast, being held April 26 this year, from 7:30 to 9 a.m., at The Amber Room Colonnade in Danbury. Funds raised by the RVNA spring breakfast help support community initiatives that include the annual Health & Wellness Fair, flu and well-child clinics, and home healthcare programs. 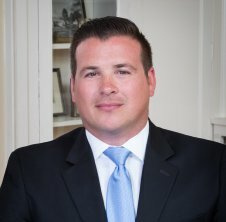 “RVNA is such a vital and treasured organization not only for Ridgefield but for almost all of Fairfield County, as well as a few towns to the north in Litchfield County and even Southbury and Oxford in New Haven County,” says Attorney Josh Weinshank, the Resident Partner in Cramer & Anderson’s Ridgefield office and member of the RVNA Finance Committee. RVNA is a Medicare-certified home health care agency whose mission “is to provide exceptional home and community health care services, support public health and safety and promote the highest quality of life.” A private, nonprofit organization founded in 1914, RVNA is overseen by a volunteer board of directors and has a staff of almost 200. Additionally, at its Center for Exceptional Care in Ridgefield, RVNA provides information and education on a variety of health-related topics. “It is a center for caregiver support, nutrition counseling, immunizations, travel medicine, well-child physicals, first aid training and illness prevention programs,” the website explains. “Through my role on the Finance Committee, and as a Ridgefield resident with my wife, Steffani, and our young daughters, I’m privileged to see first-hand the positive impact of the programs and services RVNA provides to our neighbors, young and old,” says Attorney Weinshank, who will be one of the volunteer servers at the 2019 RVNA spring breakfast. “It’s fun to serve the great community leaders who come out to support RVNA,” says Attorney Weinshank, for whom community service is an important part of his law practice, which is focused on Trust and Estate Planning, Elder Law, and Trust and Probate administration. He was recently named the new Vice Chair of the Western Connecticut Health Network (WCHN) Legacy Society, which recognizes donors who include WCHN or its hospitals—Danbury, New Milford and Norwalk—in estate plans through wills, trusts, annuities or other charitable giving vehicles. In addition, Attorney Weinshank is also a member the Danbury Hospital and New Milford Hospital Foundation Associate Board of Directors, and the WHCN Patient Advisory Council. Attorney Weinshank also serves on the Board of The Ridgefield Playhouse, the landmark nonprofit cultural hub that presents a wide variety of national and local acts in a restored theater in Ridgefield. Attorney Weinshank is the leader of Cramer & Anderson’s Fairfield County Trust and Estate Planning and Administration Group. A 2018 Super Lawyers Rising Star and Connecticut Law Tribune 2017 New Leader in the Law, Attorney Weinshank guided the opening of Cramer & Anderson’s new office in Ridgefield, where he is the Resident Partner. He may be reached by email at jweinshank@crameranderson.com or by phone at (203) 403-4005. To learn more, see his profile page. Based in western Connecticut, Cramer & Anderson has a hometown sensibility, a strong regional presence, and a worldly outlook in Practice Areas extending from Personal Injury to Real Estate, Estate Planning, Divorce & Family Law, and much more. In addition to a flagship office on the Green in New Milford, the firm has offices in Danbury, Litchfield, Kent, Washington Depot, and Ridgefield, serving Fairfield County. For more information, see the website at crameranderson.com or call the New Milford office at (860) 355-2631.